Eion has always been pretty athletic, even as a baby. His hand-eye coordination has been awesome when it comes to throwing a ball, batting, and dribbling a soccer ball. He has most recently been taking skating lessons since January of this year and has come a long way from his falling and squirming on the ice. He’s enrolled in his second class and has already passed to move on to the next one, still having 4 weeks to go in this one! The teacher has told him that he’s one of the best in the class… and believe me he’s gloating. He looks like a miniature hockey player with all of his gear: helmet, shoulder pads, elbow pads, shin guards, hockey shorts, hockey socks, his #71 Malkin jersey, skates & gloves. It’s so funny to see him skate around the rink with people watching him and commenting on how little he is and how fast he goes. Watch the little stinker go! Now, he hasn’t started actual “hockey” developmental classes yet, but he and Mike (and even Chyenne) spend hours outside or in the garage playing hockey. Mike sometimes forgets these are little kids and shoots the puck every bit as hard as if he was playing with adults. But even with bumps and bruises, these kiddos keep on playing. It’s really nice to have an activity that they all have such fun playing together. Believe it or not, Eion can get the puck past Mike when he’s in-goal and is pretty darn good at blocking shots when it’s Mike’s turn to shoot. If you ask Eion what position he wants to play, he’ll tell you, “I want to be a SHOOTER!” From my hockey-stalker days, I have plenty of memorabilia, mostly of Mark Recchi, since he was my player-of-choice, all of which now hangs in Eion’s room. Sticks that were handed to me on the way off the ice, or pucks tapped over the glass, and my autographed jerseys, bobbleheads and flags. 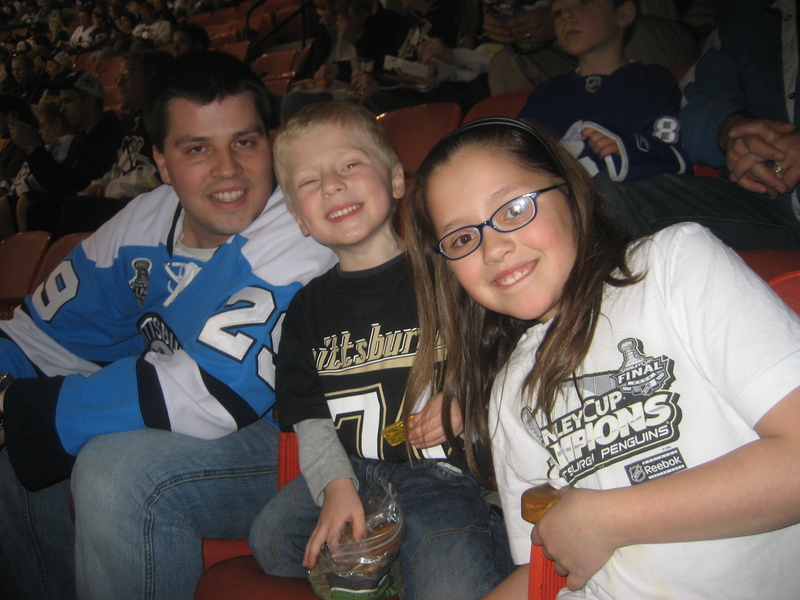 That said, if you ask E who his favorite player is, he’ll always tell you, “Mark Recchi!”. 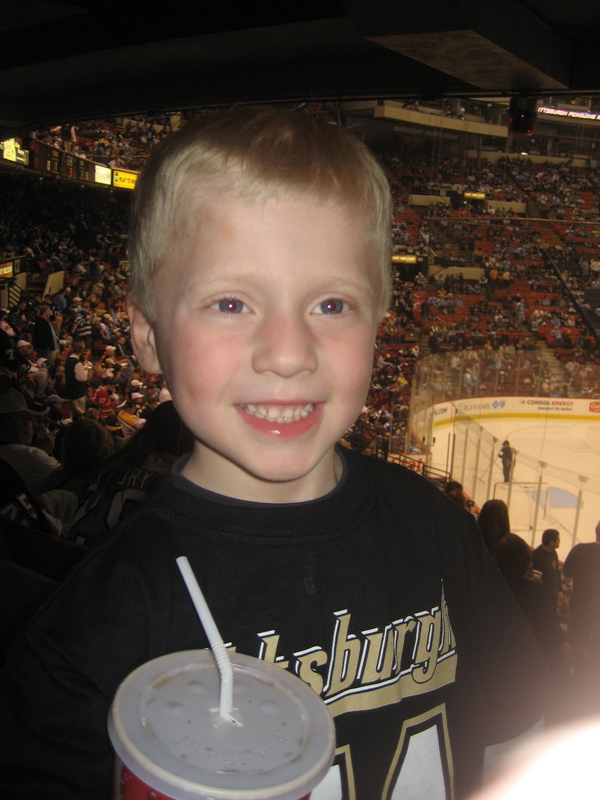 That’s not to say he isn’t a Sid or Malkin fan…. he wears his jerseys proudly. 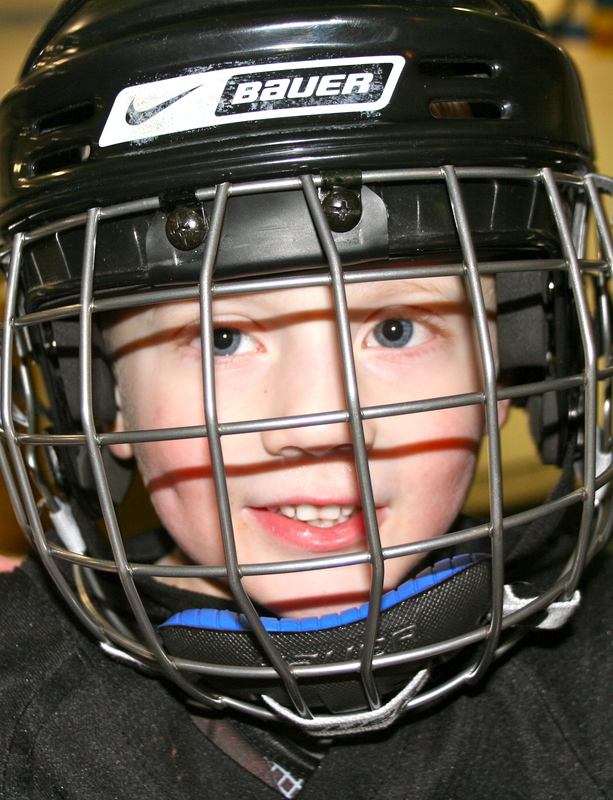 There have been many days when his hockey obsession first started that I’d find him completely suited up, sweating his little heart out, watching Spongebob, never wanting to take off his gear. 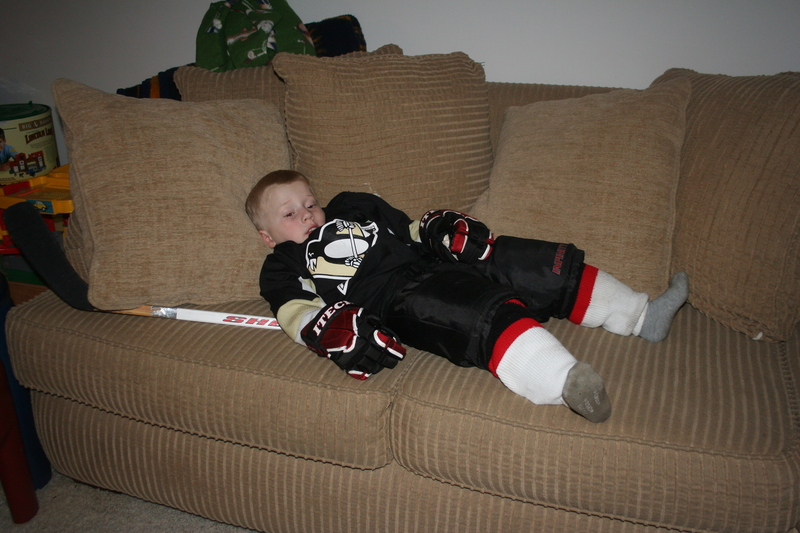 He’s been to his first Pittsburgh Penguins game this season, practices his “wrist shot” & “slap shots” nearly every day and is generally eating, breathing and sleeping hockey — well, unless he’s running around in his SuperHero attire!